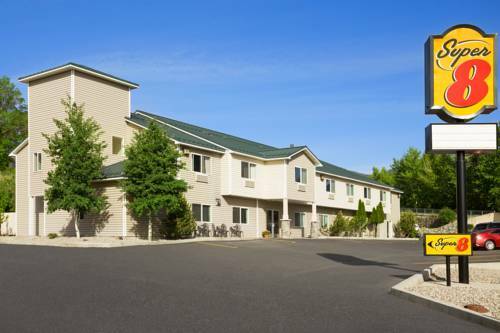 For those who love the open road, enjoy dependable quality at this Super 8 Salmon hotel, ideally located in the Salmon-Challis National Forest just 1 mile from the Salmon Valley Golf Course. Relax in nearby natural hot springs or find adventure in white-water rafting trips along the Salmon River, miles of mountain biking trails for all levels at Discovery Hill, and skiing and snowboarding at the Lost Trail Ski Area. Many businesses are nearby including Idaho Power, and Steele Memorial Hospital. Walk to many restaurants in downtown Salmon. Start your morning off right with a complimentary SuperStart Breakfast, and complimentary wireless Internet throughout this smoke-free lodging. Complimentary car and bus/truck parking, wake-up calls, and copy and fax services are available. After a long day, relax in your comfortable guest room watching the flat-screen HDTV, and enjoy the coffee/tea maker, hairdryer, and self-controlled heating/cooling. Handicapped-accessible rooms are available.